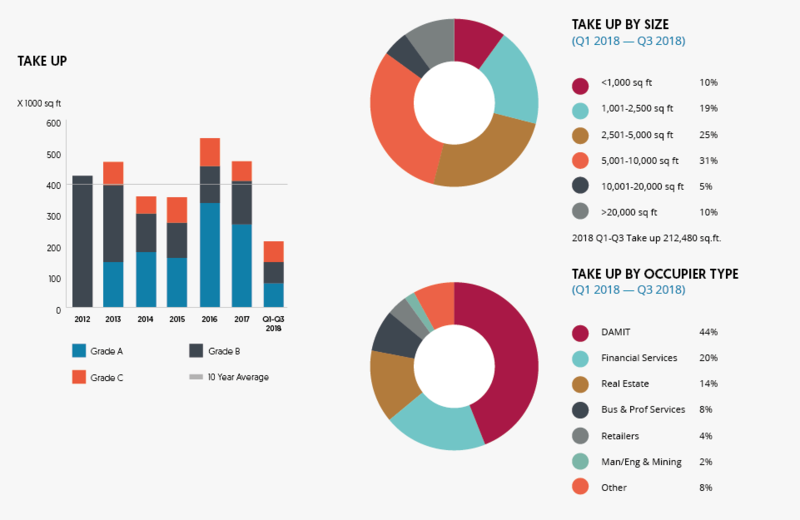 ⊲ Take up across the ‘core’ West End markets totaled 1.7m sq ft in the first three quarters of 2018 over 491 transactions. Most of the sub markets have seen activity fall below their respective 10 year averages, with Covent Garden being the only market to see activity move above trend levels. It should be understood that a good proportion of takeup involved lettings to serviced office groups. ⊲ Current estimates suggest that activity for the full year will be 2.3-2.5m sq ft, some 14% below the long run trend rate of take up for the BDGSP ‘core’ West End markets. 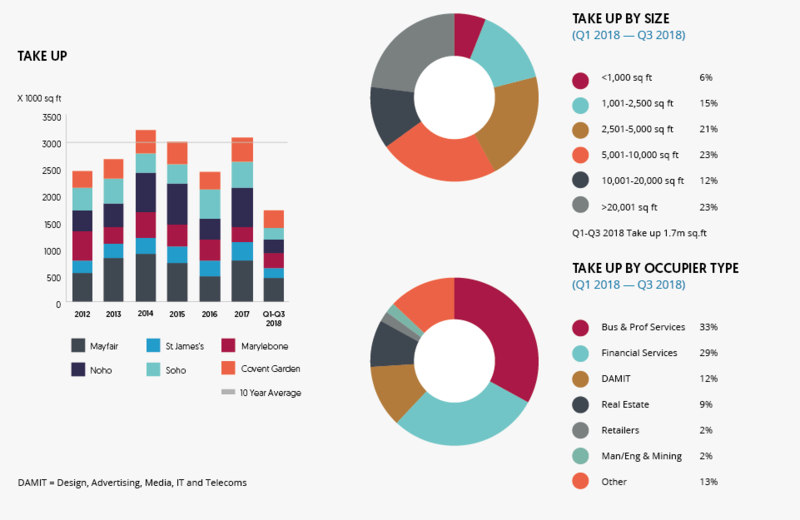 Serviced office providers have continued to play a significant role in the West End market, pushing the Business & Professional Services sector (33% of year to date activity) ahead of the Financial Services sector (29%). ⊲ Supply has tightened sharply over the first nine months of the year, falling to 2.7m sq ft at the end of Q3 2018, down by 22% from the start year figure. 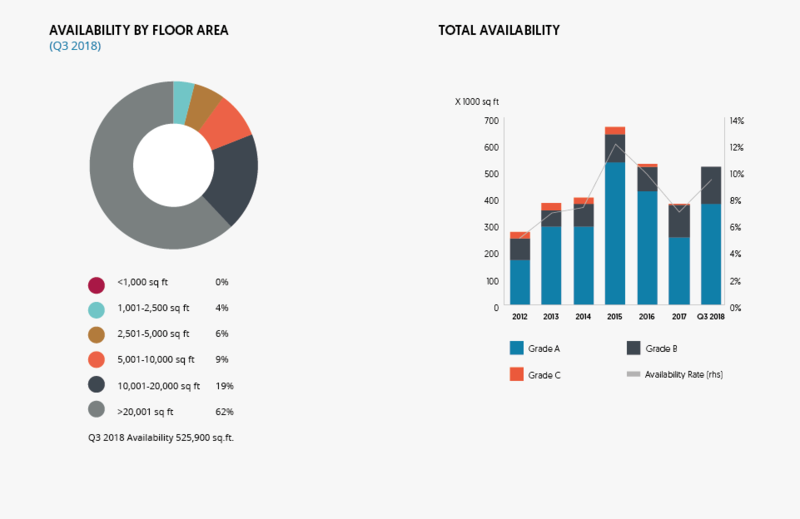 Grade A space accounts for 47% of the total ready to occupy space on the market, standing at 1.3m sq ft. The availability rate across the ‘core’ West End markets has fallen to 5.4%, the lowest level since 2015. 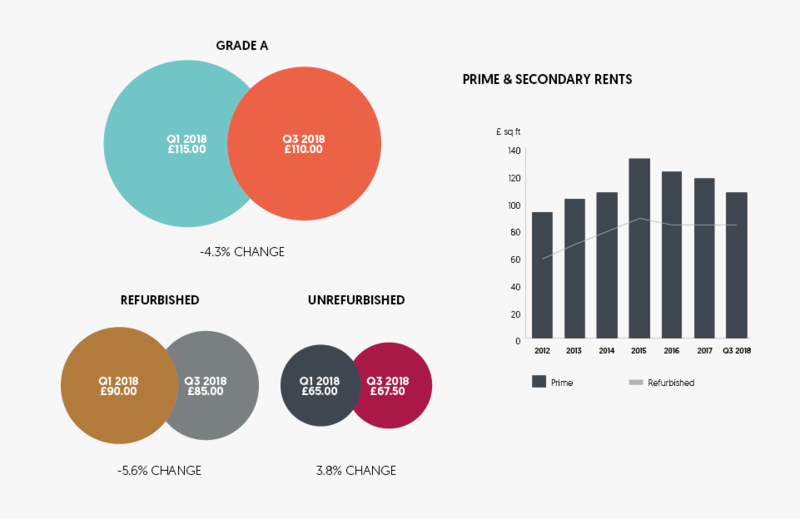 ⊲ Prime rents, in general, have edged down over the past 12 months, the only exception being in St James’s, where values have stabilised at £115 per sq ft. Rents on refurbished stock have generally followed suit, the adjustments have been less marked with refurbished rents on average falling by 1.1%. Unrefurbished stock has completely bucked this trend, with rents rising by 6.1%, with all sub markets seeing values increase. ⊲ Availability in the Mayfair market has fallen sharply over the past six months, standing at 590,000 sq ft at the end of September 2018, down by 33% since the start of the year. The primary falls have been noted in Grade A space, which is now down to 317,000 sq ft. The availability rate in Mayfair is now down to 4.7%. ⊲ Shortages in stock have impacted on transaction levels in the Mayfair market, with lettings in the year to date down to 443,400 sq ft across 146 transactions. Our expectations are that full year activity will be below 700,000 sq ft. It is quite clear that some tenants have migrated to other sub-markets. ⊲ Grade A space has continued to be the focus for occupiers, with the two largest transactions in the year being US investment bank Houlihan Lokey’s leasing of 43,420 sq ft at One Curzon Street and serviced office group London Executive Offices taking the remaining 31,950 sq ft at Park House. ⊲ Prime rents in Mayfair have eased back to £110 per sq ft, down 4.5% over the past six months and 8.3% over 12 months. Rents on unrefurbished stock have bucked the trend, moving up to £67.50 per sq ft, up by 3.8% and 8.0% over six and 12 months respectively. ⊲ Supply in St James’s was boosted by management consultancy group McKinsey’s decision to relocate from their 120,000 sq ft at One Jermyn Street. McKinsey agreed to move to Brockton’s The Post Building, Museum Street in Q1 2017, with completion due by the end of the year. 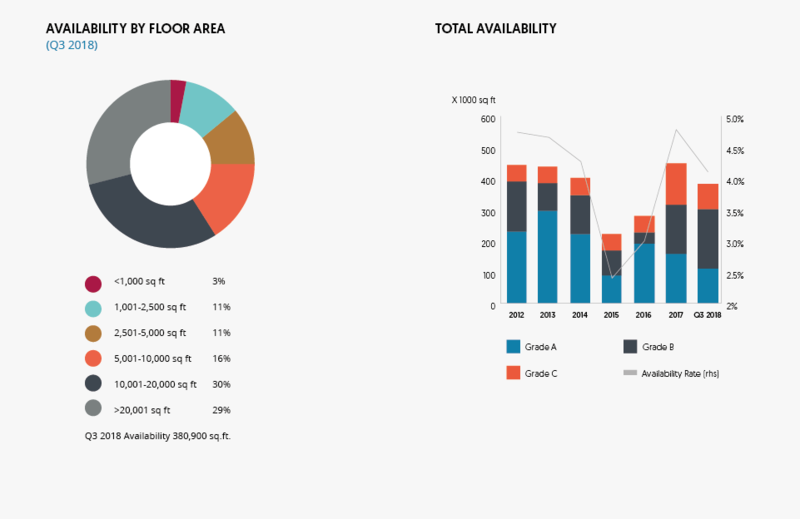 Total availability is 525,900 sq ft, an increase of 35% since the start of the year. The availability rate in St James’s stands at 9.5%, the highest amongst the ‘core’ West end markets. 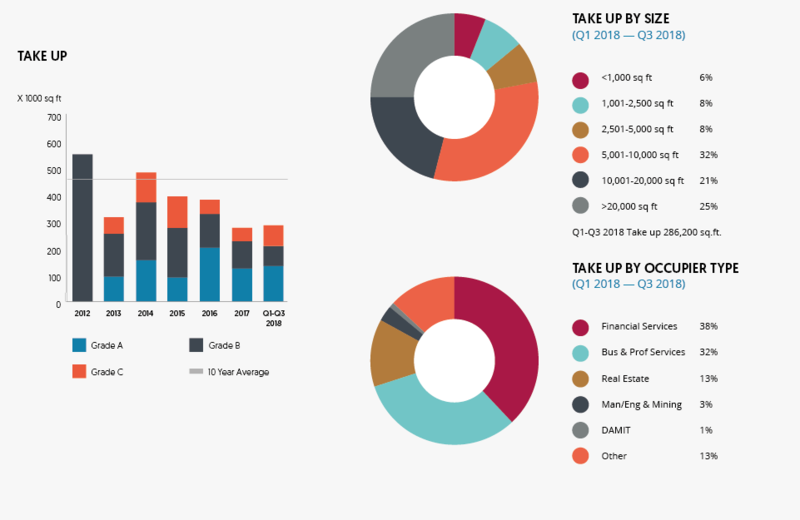 ⊲ Take up has slowed in the first nine months of 2018, with a total of 175,750 sq ft of lettings across 47 transactions. Activity for the year is expected to reach circa 250,000 sq ft, falling below the 10 year average for the first time since 2013. 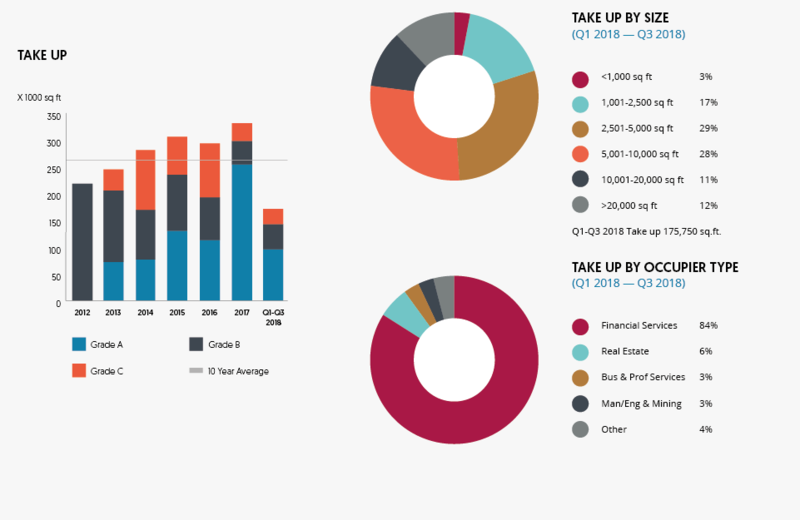 ⊲ Take up over the year has been typified by a reduction in the number of larger lettings, particularly over Q2 and Q3, with the largest transaction over the six months being the 9,505 sq ft letting of the final element of 2 St James’s Market to J O Hambro Capital Management. The freeing up of the McKinsey space may see activity increase in the final quarter of the year. ⊲ Prime rents have remained stable at £115 per sq ft in 2018 and now stand ahead of prime Mayfair rents. 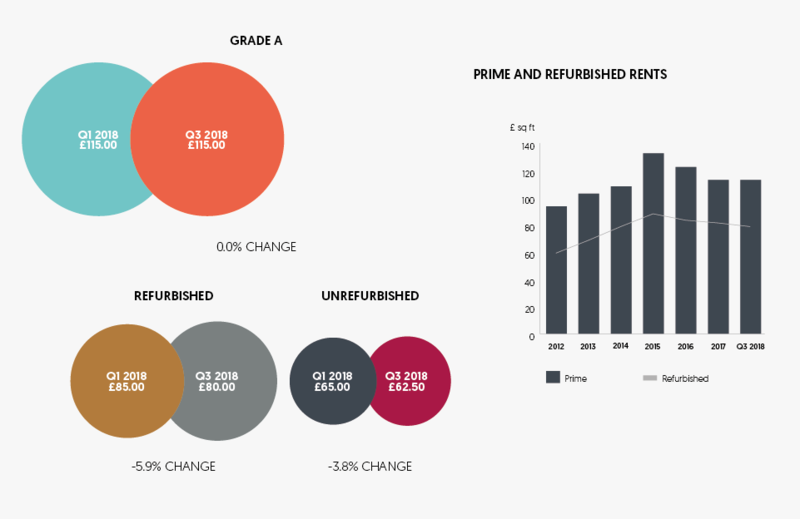 However, unlike the Mayfair market, rents on refurbished and unrefurbished space have slipped back over the past two quarters, falling by 5.9% to £80 per sq ft and 3.8% to £62.50 per sq ft.
⊲ Take up in the Marylebone market has recovered strongly from limited activity in 2017, with activity in the first nine months already 3.7% ahead of last year’s total at 286,200 sq ft across 75 transactions. Take up for 2018 is expected to reach 380-400,000 sq ft, this will remain below the 10 year average for the fourth consecutive year. 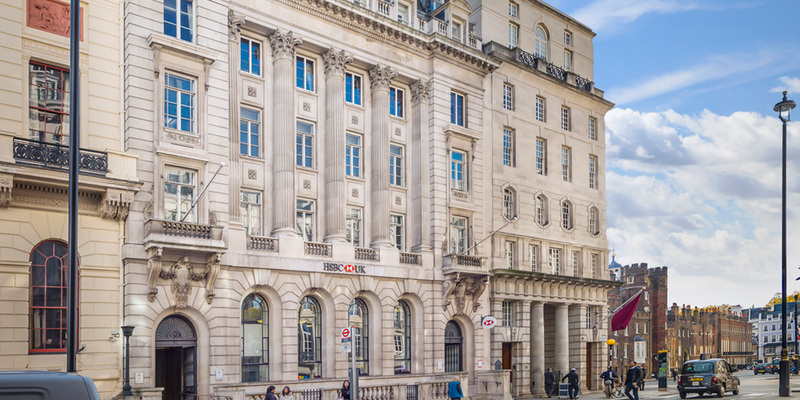 ⊲ Several larger transactions have completed in the year to date, the largest being the 26,650 sq ft letting to ASI (medical user) at Lazari Investment’s One Welbeck Street, whilst investment managers Orbis took 23,525 sq ft at Howard DeWalden’s 15 Portland Place. ⊲ The availability rate in the Marylebone market has remained below the other ‘core’ West End markets over the past five years standing at 4.1% at the end of Q3 2018. 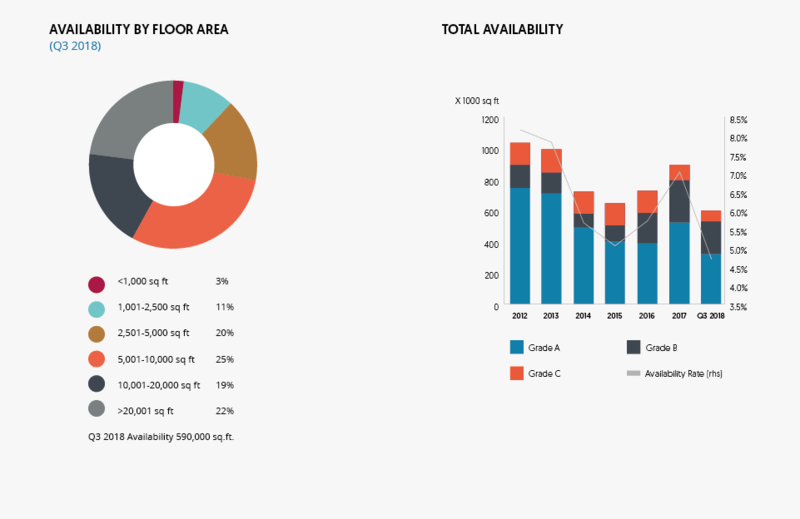 Total availability is 380,900 sq ft, with only 29% of the total being Grade A space. ⊲ Both prime and refurbished rents have reduced over the past six months, with prime rents down by 5.6% to £85 per sq ft and refurbished rents falling back by 6.5% to £72.50 per sq ft. Rents on unrefurbished remained stable at £60 per sq ft.
⊲ Transaction levels eased in the first three quarters of 2018 following the strong take up recorded in the previous 12 months. 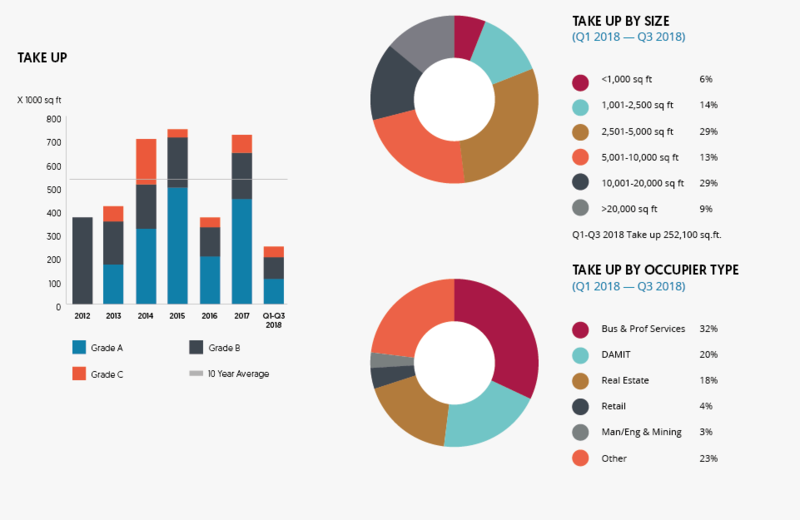 Take up has totalled 252,100 sq ft over the past nine months across a total of 80 deals. The current deal count is 40% below the comparable figure in 2017. ⊲ The largest transaction in Q2/Q3 2018 was the 18,100 sq ft letting to Benevolent AI at NFU Mutuals’s Maple & Midford Building on Maple Street, whilst lottery group Camelot took 12,950 sq ft at WELPUT’s 101 New Cavendish Street. ⊲ Supply has tightened considerably over the past 12 months, coming in from 662,200 sq ft in the final quarter of 2017 to 362,600 sq ft at the end of September. 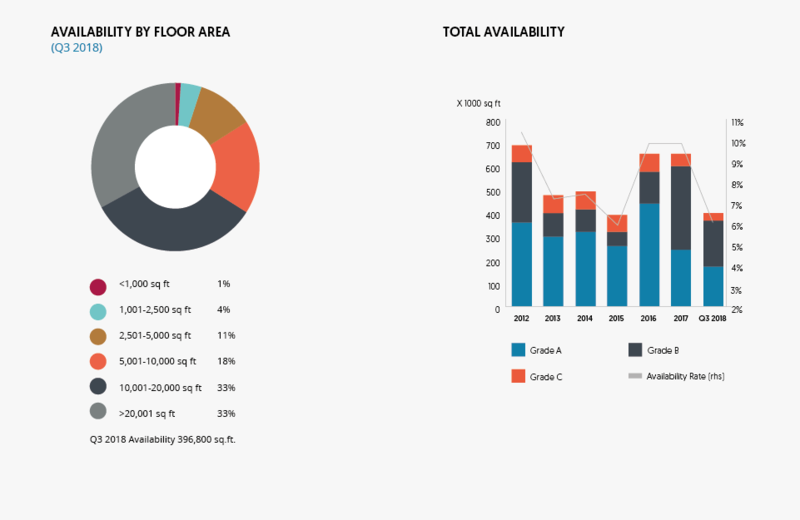 Grade A space represents only 30% of overall stock on the market in Noho, with the largest Grade A space being at 101 New Cavendish, which is under offer. The availability rate in Noho is now down to 4.2%, the lowest level since 2015. ⊲ Prime rents edged back down to £80 per sq ft by the end of Q3 2018 and are now 11.1% below their peak levels of early 2017. However, shortage of stock across the Noho market has seen rents on unrefurbished space continue to edge upwards, increasing by 5.3% to £50 per sq ft. 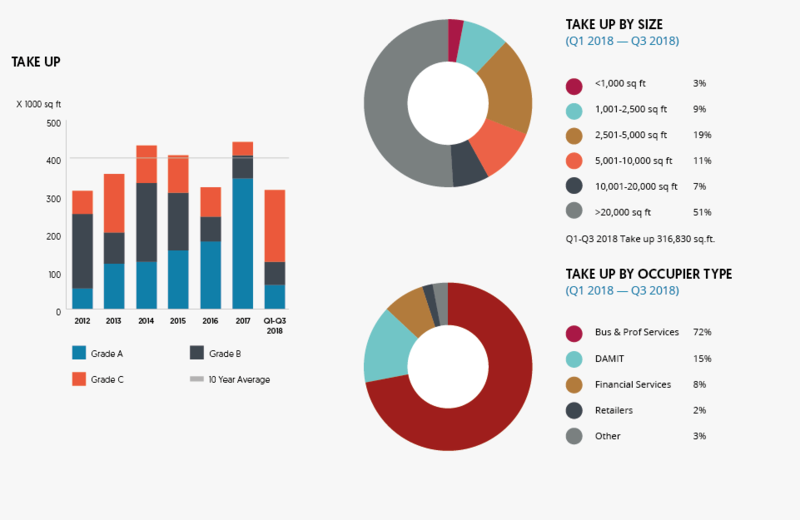 Rents on refurbished stock remained stable at £65 per sq ft.
⊲ After a slow start to the year, Q2 and Q3 has seen an upturn in activity, with transactions in the year to date standing at 212,500 sq ft across 90 deals. The Soho market is typified so far this year by smaller lettings and has seen only two transactions above 10,000 sq ft.
⊲ The largest transaction in the year to date was the 21,250 sq ft letting at 33 Glasshouse Street to Apple, whilst Israeli investment group Meyer Bergman took 10,600 sq ft at 30 Broadwick Street. 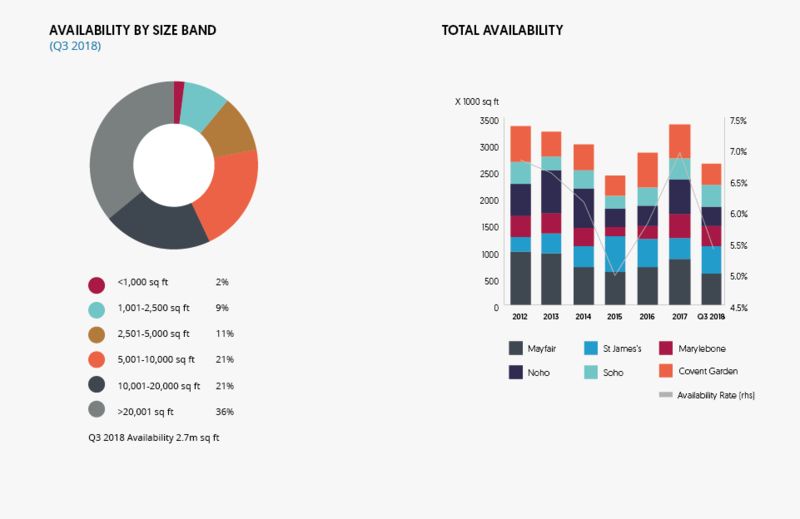 ⊲ Supply in the Soho market has been edging up over the past three years, rising to 418,420 sq ft at the end of Q3 2018. 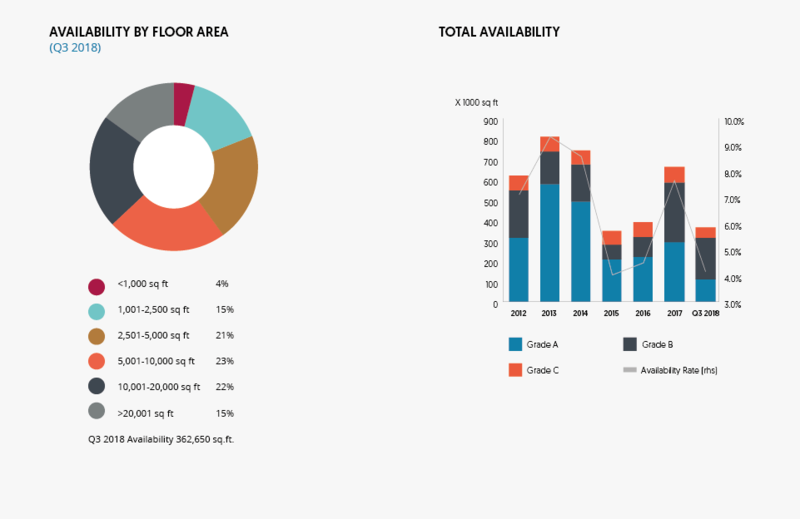 Whilst total availability has increased by 68% since 2015, there has been a tightening in Grade A space, particularly since 2016, when a number of new schemes came to the market. Grade A supply now accounts for 38% of total ready to occupy stock on the market. ⊲ Prime rents moved down to £90 per sq ft at the end of Q3 2018, a fall of 7.7% over the past six months and 14.3% from the peak levels of £105 per sq ft at the start of 2017. 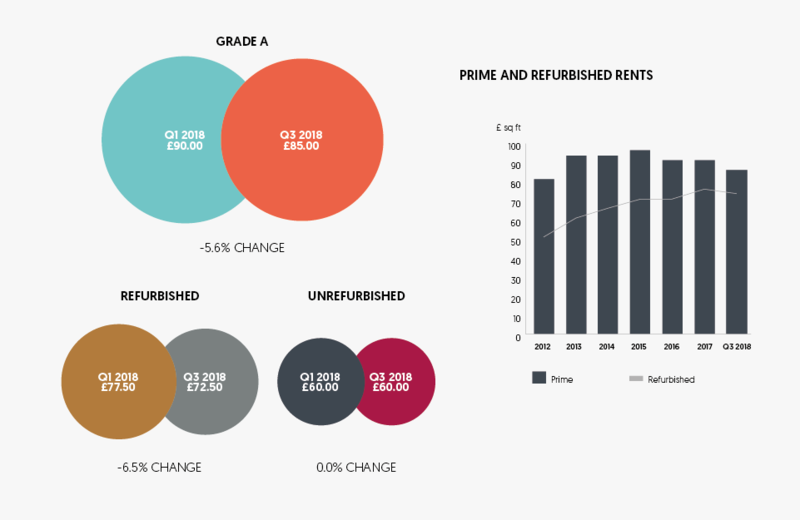 Despite the falls in prime rents, values on both refurbished and unrefurbished space have remained stable at £72.50 per sq ft and £55 per sq ft respectively. ⊲ Supply has fallen sharply in the Covent Garden market as a number of new developments/refurbishments that came to the market over the past 18-24 months have been let. Total supply at the end of Q3 2018 stood at 396,800 sq ft, with Grade A space down to 167,450 sq ft, 42% of the total. The availability rate is now down to levels broadly comparable to the low point in 2015 at 6.0%. 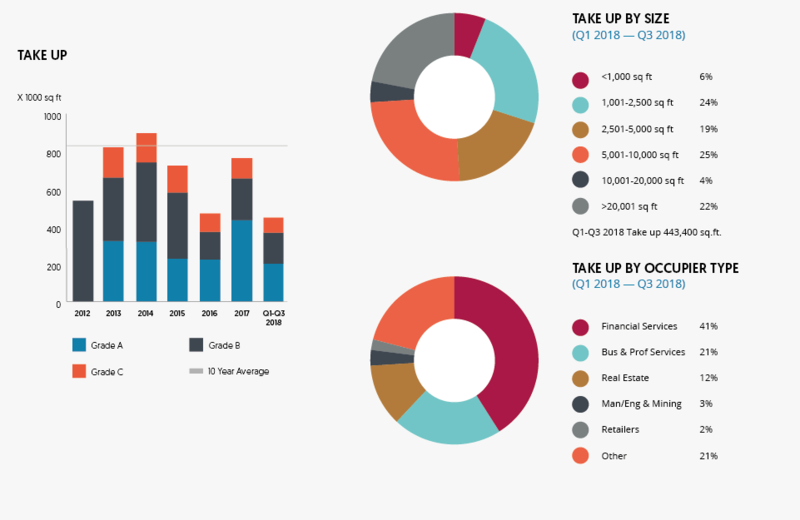 ⊲ Take up is expected to rival last years total, with 316,830 sq ft of lettings recorded in the first nine months of the year across 53 transactions. The year’s total was boosted by WeWork’s leasing of 131,500 sq ft at Aviation House, 125 Kingsway. This move follows on from WeWork’s letting of 125 Shaftesbury Avenue in June 2017, which was then under let in its entirety to Facebook. ⊲ Brockton Capital and Oxford Properties 263,050 sq ft The Post Building is due to complete in the final quarter of the year, with 125,450 sq ft already let to McKinsey. The remaining 137,600 sq ft will provide a welcome boost to Grade A stock in the Covent Garden market. 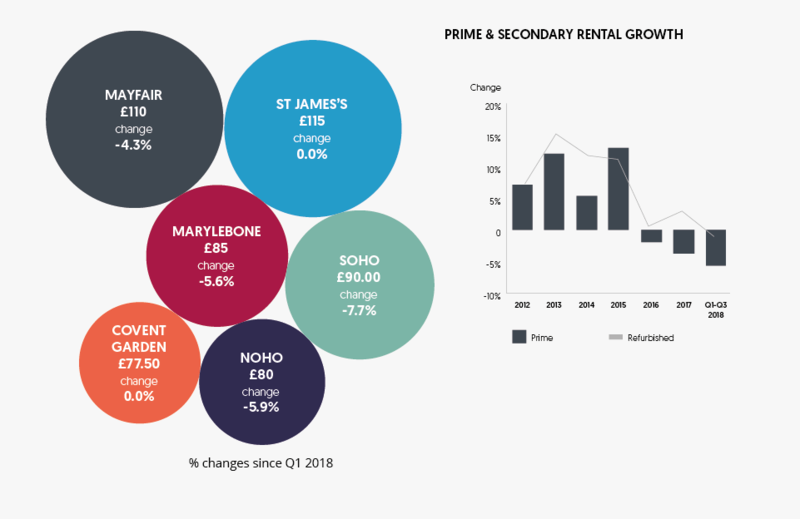 ⊲ Prime rents have remained stable at £77.50 per sq ft over Q2 and Q3 and the Covent Garden market offers the lowest prime rents amongst the ‘core’ West End locations. Refurbished rents have moved up by 3.8% to £67.50 per sq ft, whilst rents on unrefurbished space remain at £52.50 per sq ft.
Based on the above we are proud of our position as the No. 1 Mayfair Office Agent. a member of the office agency team.